Glens Falls Business Machines, Inc.
We have a new Android App for our customers. With our GFBM App you can Request Service and Order Toner right from your Android powered device. The App also has our company contact information and handy links to our manufacturer websites. 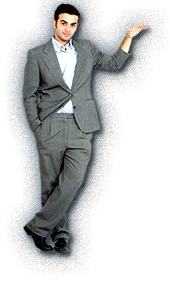 To download the GFBM App search GFBM from the Android Market or Click Here for more information. *iPad & iPhone App coming soon. Birmingham, Ala. – October 28, 2010 - Executive Technologies, Inc., the developer of SearchExpress Document Management software, today announced the entire family of SearchExpress products can be integrated into Kyocera’s HyPAS enabled multifunctional products (MFPs), allowing users to capture, index, route, search and manage paper and digital documents. Kyocera Mita America Incorporates Advanced Data Security Into Multifunctional Products Using API's Cryptek Netgard TM. Scan from your MFP to your PC with added speed, functions and versatility. Advanced Scanning Made Simple - Scanning is one of the most important functions of document workflow and should be easy to use and serve the purposes that your company needs. With Kyocera's PinPoint Scan application, scanning to your PC from your network connected MFPs becomes as easy as scanning from a desktop scanner but with the added speed and versatility Kyocera MFPs provide. With a simple two step installation process, one download to the MFP and one to your PC, network scanning couldn't be easier. 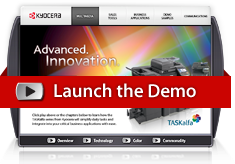 Kyocera announces the TASKalfa series Color Multifunctional Systems. Increased office productivity is your top priority. The Kyocera TASKalfa Series of color multifunctional systems transforms your office, your workflow, and your documents. Powerful, intuitive, and incredibly efficient, it makes a bold, impression both inside and out. Type in the item # or model # to search for a Compatible Print Cartridge (Toner & Drum). To print out a Printer Cartridge Order Form click HERE. - by phone call (518) 793-7761 or (800) 627-7761. To print out an order form click HERE. Copyright 2009. Glens Falls Business Machines Inc. All Rights Reserved.